Home > Opinion > Thistles of Innovation, a Blue Economy for Scotland? Thistles of Innovation, a Blue Economy for Scotland? Perhaps I’m being unfair on the poor reporting of the Scottish media, I too had my doubts about attending the conference in my somewhat no very well wee car. About an hour into my six and a half hours drive from the metropolis of Assynt to Morrison Street, Edinburgh I began to ponder why the OECD (that’ll be the Paris headquartered OECD) were hosting a conference on Enhancing Rural Innovation in the middle of the city centre at the EICC. Now don’t get me wrong, I think that that the EICC is an excellent purpose-built venue, with a few suites capable of holding a couple of hundred folk and a fancy auditorium for all manner of keynote speeches and important announcements for delegates. They also cater fab food served by friendly staff. I merely ponder why a conference all about rural sustainability couldn’t have bitten the bullet and headed for either Dornoch or Dalbeattie. Think of the economic and social impact of having over 400 delegates from 30 countries in town for a three day conference might have had on an out-of-season rural area North or South of the Central Belt? Sure there aren’t many mega corporate hotels in Dornoch and I shudder at the thought that one day Dalbeattie will favour a Costa over the joy of the De Caff café. However, if the above suggestions were too rural, then why not the rural capitals of the North and South, Inverness has the Eden Court, Dumfries the Crichton Campus, both more than capable of hosting such large events and more importantly right in the heart of the plural rural. My concerns were compounded when I glanced at an overhead display showing which sectors the delegates were currently representing. Over 50% government employees, a further 35% representing Non-governmental agencies, academia and charities followed by the business lobby at 10% and finally the remainder, the interested individuals like myself who were there on their own buck or inside the EICC avoiding the rain. Fearing a self-congratulatory back slapping fest of polyglottal bureaucrats, I thought to myself, ‘ Och, I’ll just make the most of it’ and as we were ushered in to the first session exploring the ‘Smart Rural Communities’, a group of similarly minded pan-European rural based malcontents were soon discovered and the heavy bonding began. Grievances on the chasm-like disconnect between the rural and National, central and local government were poked at and probed. The question of ‘trust’ came to the fore and slowly emerged as one of the major conference themes. Local communities (all volunteers), recognise problems in their communities, identify cost effective solutions and go cap in hand with smiley teeth to the first branch of local government, where rules, regulations, bureaucracy and above all else, fear hinders the path to a sensible solution. Evaluations are required, business plans demanded and sundry other mechanisms are placed in the way of the folk who live with the problems. Volunteer time, effort, study and money are all spent, bending to accommodate the paid red tape requirements, when all are agreed, and plans submitted… Boosh, you’re told, “not good enough away and raise some money for an external consultant, you crazy bunch of amateurs you” or words to that effect. A succession of worthy individuals from across the world took to the various stages to explain how they had tackled inequality, poverty, unemployment, social and cultural disconnection, a lack of affordable housing and halting the progress of the young leaving the rural never to return. Much of it, particularly from some of the academic cohorts, was basically technocratic babblese with the free Wi-Fi being handy as I searched for words rarely used outside of thought leader bubbles, the rest was well thought out and incredibly innovative. Scotland was well represented among the speakers on subjects ranging from aquaculture, renewable energy the need to address the digital divide and tourism. Notable among the Scottish speakers was Amanda Bryan of the Eigg Trust and chair of the recently devolved Crown Estates Scotland who spoke passionately about community led social innovation and the need to encourage and captivate young people with innovation. Another enterprising Scot hailed from deepest Galloway, Duncan McConchie took the audience through his journey from a one man archery course to an outdoors activity centre, luxury pod and wedding venue via Zorbing, the longest zipwire in Europe and Duncan being the guinea pig for the world’s first human catapult. Think a big rubber band, harness and towed back to stretching point by a Land Rover and released. Boing! Laggan Outdoors is now a major employer and destination for visitors to Galloway. Much of their success was in applying creative thinking to the restrictions the local authorities planning panjandrums forced upon them and working with some of the more innovative folk at Scottish Enterprise who recognised the need to accept risk and work with innovators. Delegates from Spain, Korea, Lapland, Newfoundland and Japan spoke about how they recognised the potential of the rural and were encouraging different takes on solving the usual problems. It was only when the guest speaker Gunter Pauli gave his presentation that the faded ennui of conference life was shaken off. Pauli is the serial entrepreneur and author of ‘The Blue Economy’ which posits 100 innovations over a 10 year period will lead to 100 million jobs. Known as “The Steve Jobs of Sustainability”, he built the world’s first “ecological factory” when chairman of Ecover in 1992. Since then he’s been involved in subjects as diverse as the regeneration of the rainforest in Colombia, a maggot farm in Benin, the revolution of the beer industry in Patagonia via wild yeast and creating 300 companies around the world that farm mushrooms on a bed of coffee waste. These are merely the tip of the iceberg, ideas flow from and to Pauli. My ears perked up when he spoke about an old, polluting, disused petrochemical plant in Sardinia that has saved Sardinian agriculture and created hundreds of jobs via a weed that also happens to be Scotland’s national flower, the humble thistle. Gardner’s around the world spend millions on weed killers trying to eradicate the tough resilient plant. In Scotland we see the thistle as a symbol, a badge of honour. MacDiarmid viewed Scotland askance as a drunken man looks at a thistle, but most of all we see it as a nuisance, something to be rooted out of thousands of front lawns all in the quest for gardening perfection. In Sardinia it’s the main component in the reconversion of a petrochemical facility into a bio-refiner that uses the plant to make plastic products that are all biodegradable and recyclable and will ultimately serve as fertilizers. Pauli’s enthusiasm for creating a better more sustainable planet is infectious. He reels off initiative after initiative that he’s involved in. These range from making batteries made from wood; animal feed protein production from fly larvae, stone transformed into paper, coffee turned into bio chemical’s that absorb odours and protect our skin from UV rays. Some are so simple you wonder why the world of fishing and farming isn’t kicking themselves in their collective backsides. In Germany one pig farmer has his pigs and chickens living together. The pigs are happy, they have no infections, no ticks or parasites because the chickens groom them as source of food. It takes three days to potty train a piglet…three days, which means they are not living in their own waste. The waste of course is kept in one place and used in all manners of fertilisation for example. The chickens are abundant layers, they live year-round with the pigs, and lay eggs all year, benefitting from the body heat of the pigs in winter. The Island of Hierra, one of the small almost forgotten Canarian Isles had decimated its fish stock a marine reserve was decreed to allow fish to repopulate, the practise of catching female fish was abandoned. It’s normal for fishermen around the world to catch females with eggs and throw them along with all other fish on freezing ice for market, separating the female from the male increases the fish stock. Pauli’s list is seemingly endless and grows simply because of a refusal to accept that great Scottish maxim, ‘That willnae work’. I found myself enthused about the conference seeing it as an exchange of ideas, where those normally dressed in sombre office outfits could loosen up and listen to dreamers and the ambitious. 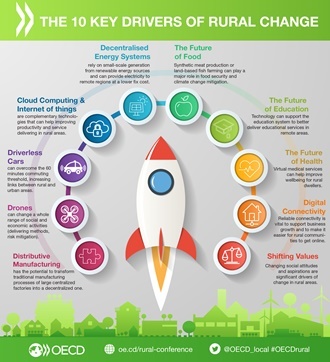 The conference ended with a sort of pre-ordained set of objectives that have been decreed as the ten key drivers of rural change (see attached image) that have been identified as significant players over the coming 30 years. Each one of them masks a multitude of questions and hopefully innovative answers to the age old problems of making the rural sustainable. Thanks , that fair cheered me up ! Good article. In relation to the EU and Brexit, I don’t think I’ve yet seen any commitment from the Scottish Government to continue the LEADER programme. A bit of a light bulb moment for me reading that. What if we realise that nature has been making powerful, useful chemical products for tens of millions of years. Theses products are mostly bio degradable and safe for our planet (since they evolved here in a sustainable way). It opens a whole new approach and makes our current, dig-it-up-and-burn-it, method of running our planet seem a little crude. Imagine if these processes could be made un-patented and open sourced for improvements? That would be an industry to inspire our young folk. Earn a good living, repair the planet and live in a beautiful place like Assynt? No brainer. We need to get the twin shackles of giant corporate greed and mega, mono-landowning off our backs quickstyle. The developing awareness of global plastic pollution is an example of big business that knew exactly what it was producing, where it ended up, and how long it would persist in the environment. Plastic production being the sister company of Big Oil folks are only now waking up to the long term environmental havoc that they have wreaked. Similar to antbiotic production where over production and overuse is leading to a global health crisis. But that’s another story. I checked out the Blue Economy website but I could not find its position on intellectual property (IP). It goes on about competitiveness and too much standardisation and government spending. Does it advocate the usual proprietary commercial approach to patents, trade secrets and so forth? If so, I imagine it will be ineffective at delivering the kind of real innovation where people share openly the building blocks of technology and standards like the web and much of the renewable energy sector. Bang on to suggest a rural conference being sited in a rural region, rubbing shoulders with those in rural life who could provide a real-time, real-place context, not just a conference-culture environment. “Pauli” will have developed his impetus on the ground, not in a conference hall, and it raises questions about where the inspiration and the innovation really arise. I have always argued for grass-roots, bottom-up resourcing of development, and in general around the world that is where it really happens, and the governments and NGOs measure it, they dont make it. Many thanks for the positive comments on the article. There was so much to condense, particularly once I started looking into Gunter Pauli and some of the project’s he’s been involved with. If you have any further interest in the work he’s doing on sustainability have a look at Plan A…(there is no Plan B) for the rural economy in Argentina. Since his lecture I see countries around the world adopting his problem solving approach, be that electric cars being charged by driving on roads in Sweden or Namibia investing in LiFi (which of course was pioneered in Edinburgh). Apologies if I’m gushing, it’s just rare to see someone view a problem askance and come up with effective solutions that help people. When he opened the Ecover factory in Belgium, he only built 7 parking spaces for a staff of 100 and paid them 50 cents per kilometre to cycle to work. He saved on land use and construction costs of a car park, the employees didn’t pay to sit in traffic queues, they cycled to work, got healthier and were paid to do so. It’s those small approaches that make all the difference. In response to sleeping Dog, I’m not sure on the IP of the mentioned plans, I suspect there’ll be commercial restraints on some of the projects, particularly the thistle bioplant which had a huge R&D budget up front. The mushrooms from coffee grinds has proven popular around the world, growing an edible fungus for free surely means nobody should be going hungry!